I was very lucky that Ugu Bigyan’s was part of the itinerary during our short vacation with our relatives. It’s not my first visit but it is always lovely to go there. Sure I feel sorry that I can’t flood this blog with photos of the food we had. But not that sorry because I couldn’t bring myself to stop people from enjoying it sooner. I didn’t hold back myself and had a piece of the action. I glanced at my camera a couple of times and thought, Nah, I’ll do that another time. We weren’t hungry. In fact we had a heavy eat all you can breakfast at Villa Escudero just a few hours before getting to Ugu Bigyan’s in Tiaong. But it was as if we were starving when we ate. I’m far from being eloquent which is why I often hope the pictures would do the talking but let me try at least. 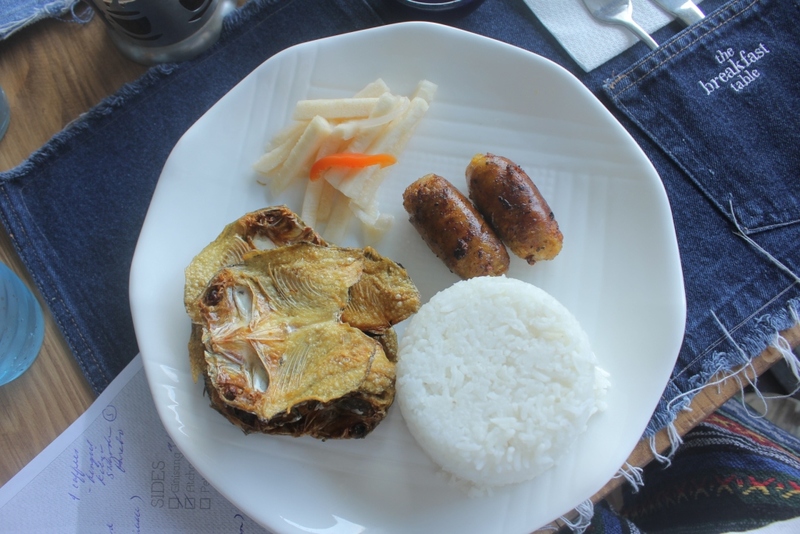 Ugu Bigyan’s menu was simple and straightforward Filipino fare. I loved it that nothing was too overpowering and you can still have the natural taste of food: the hint of sweetness and flavor of the sea was in the seafood they served including shrimp, clams, mussels, fish and squid. I welcomed the original dishes which did have refreshing twists. But, nothing was bold to make it too far modern from the Filipino recipe. The pako salad had apples. The ginataang hipon was deshelled and deveined. There were no shells in the ginisang tahong. The ensaladang talong had gata. The sweet and sour fish had soft tofu bits in its sauce. 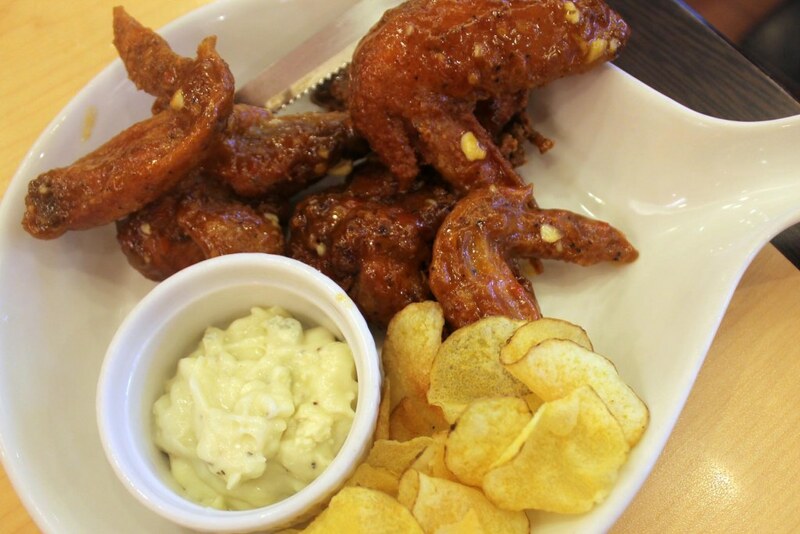 The calamares was paired with a light sour chili dip. Everything from the soup to the dessert was light to the palate, very Filipino and perfectly complementary with each other. Of course the food is only one of many reasons to visit. Check out my older post about the ambiance here. We were to have dessert alone but there was heavy traffic so I decided to have lunch there too (so much for trying out Juju eats). We were starving as we came straight from our adult gymnastics class (my 32nd birthday celebration). I lowered my expectations as I am not very fond of hi-carb and hi-sodium meals that leave me feeling bloated. I was greeted with a lot of tables which was a relief as I often see long queues at Kanto Freestyle Breakfast. 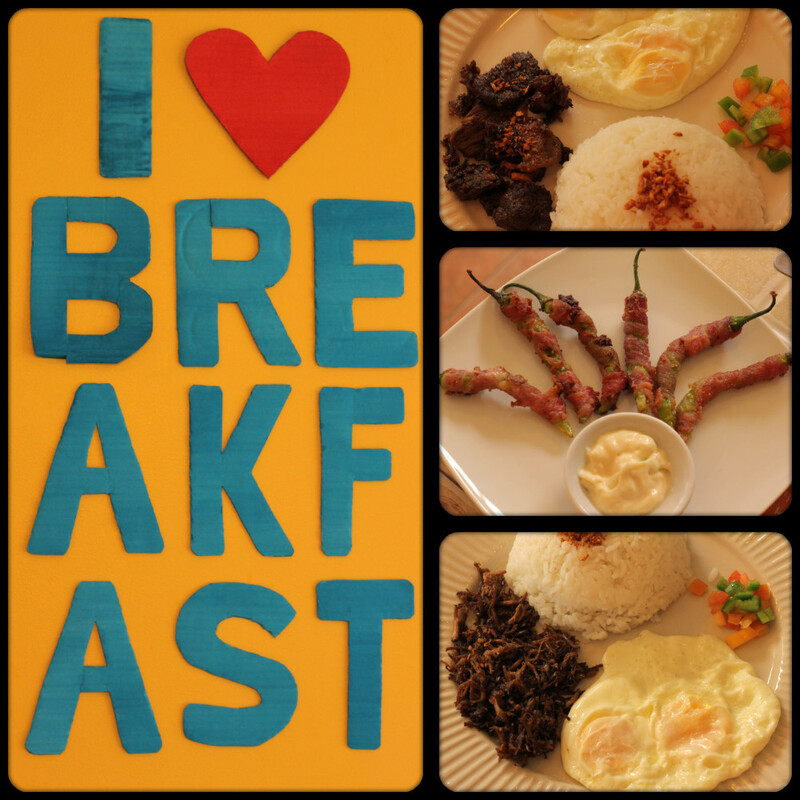 We ordered Batangas Tapa, Honey Garlic Chicken and Pork Belly. Additional servings of tomato pesto, bacon and a selection of mini pancake stacks were necessary. Hahaha. If I had known that the serving won’t be as salty as the usual Filipino fare, I wouldn’t have chosen set meals. I would’ve skipped the rice and the eggs and just had vegetables and meats. 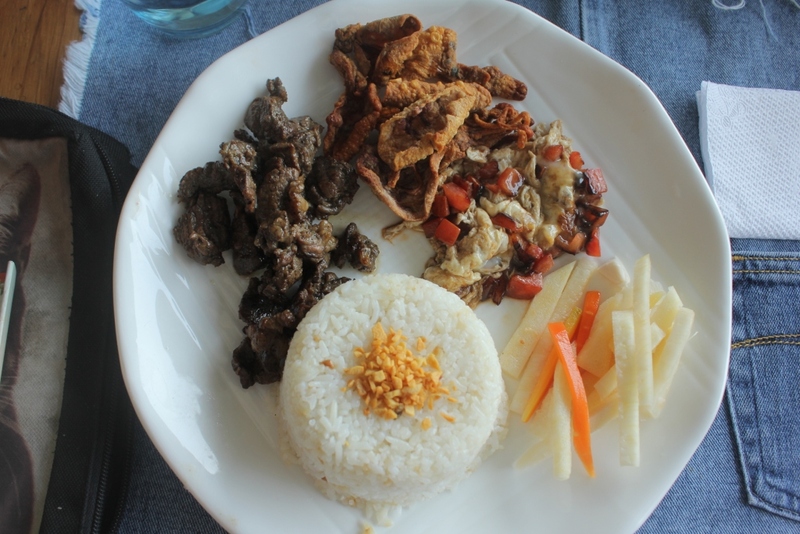 The Batangas Tapa was on the sweet side but I guess that’s how it’s supposed to be. The honey garlic chicken on the other hand tasted fine but it seemed a little too greasy. The dark golden crisp of the chicken suggested overly used cooking oil. Or it could be the breading they used. All I know is that it didn’t look that appetizing. The sauce was flavorful but too sweet for me. I’m thrilled of the pork belly though and I had phil order one more of that. I liked their presentation, their service and their food. I was pretty much satisfied with the flavors. I love the make your own breakfast plates, the dessert selection and the fact that they have brewed coffee. I mean most cheap food joints would give you a 3-in-1 pack and a cup of hot water. I love it that they’re not that salty too. Nothing was too pretentious. Everything was familiar yet nothing was ordinary. Our total bill was 642 pesos for three people. It was more than enough for us. If there’s one thing I didn’t like, it was the bacon. They should change their brand because it would be such a shame to pair that with this plate of wonderful mini stacks of pancakes with fruit, glaze, peanut butter and chocolate. Yum! Cheers! I did enjoy my trip to The Breakfast Store in Katipunan Ave but never really took that second trip because they only “sell” breakfast goods not “serve”. I’m glad they opened The Breakfast Table and it is perfect in so many ways. The only criticism I have so far is that the garlic in garlic rice wasn’t freshly sautéed (they were the bottled crunchy type) and the danggit was too crunchy which I suppose is not even a problem for others. hahaha. 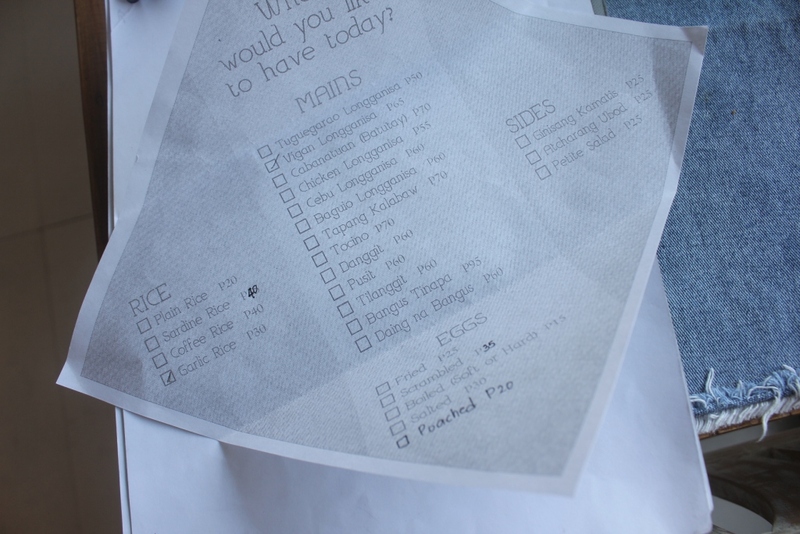 Here, I list things I love most about The Breakfast Table in Maginhawa St! They have dessert. 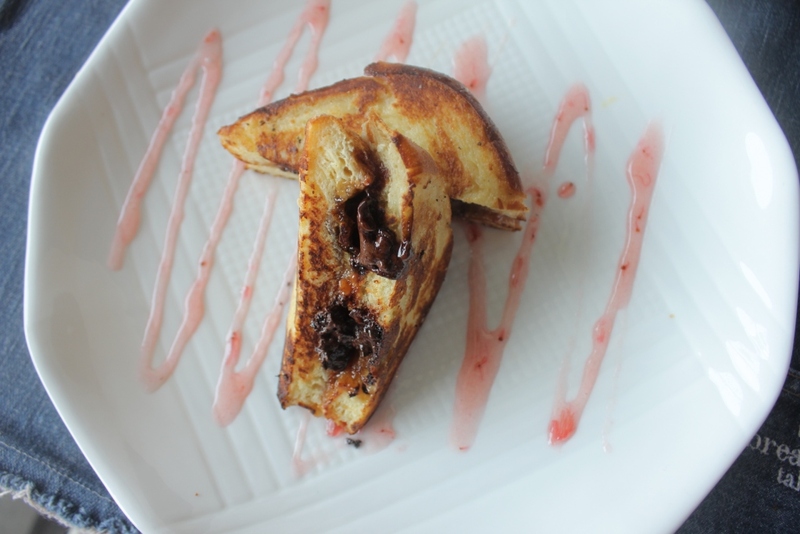 We’ve only tried French toast but it’s convincing enough for me to try the rest. 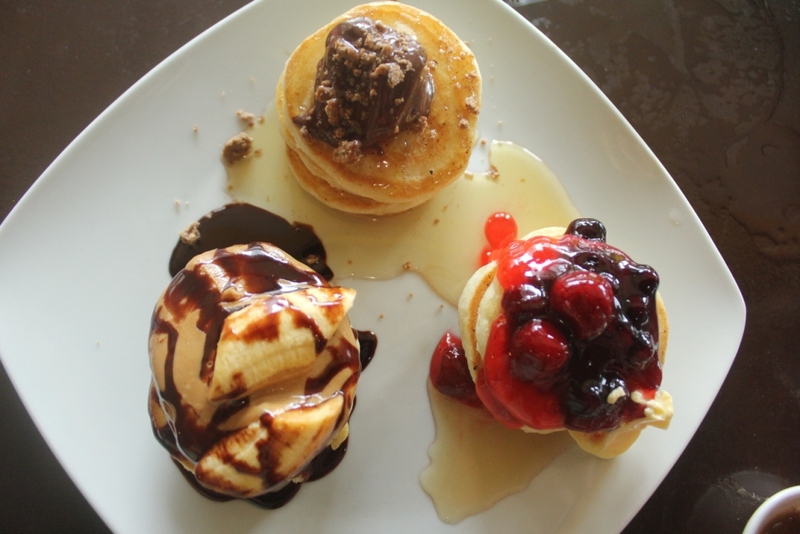 For some people dessert is what makes breakfast a good one. That’s not all. 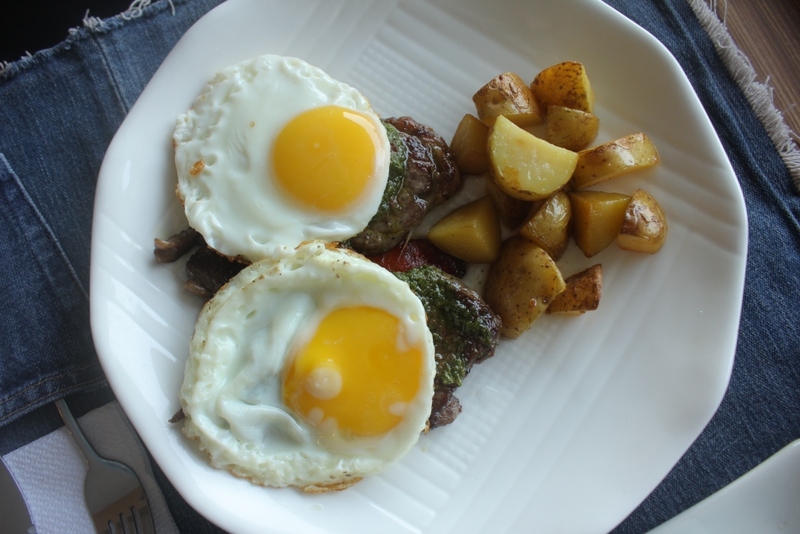 We’ve tried their perfectly tasty without being salty steak and eggs. 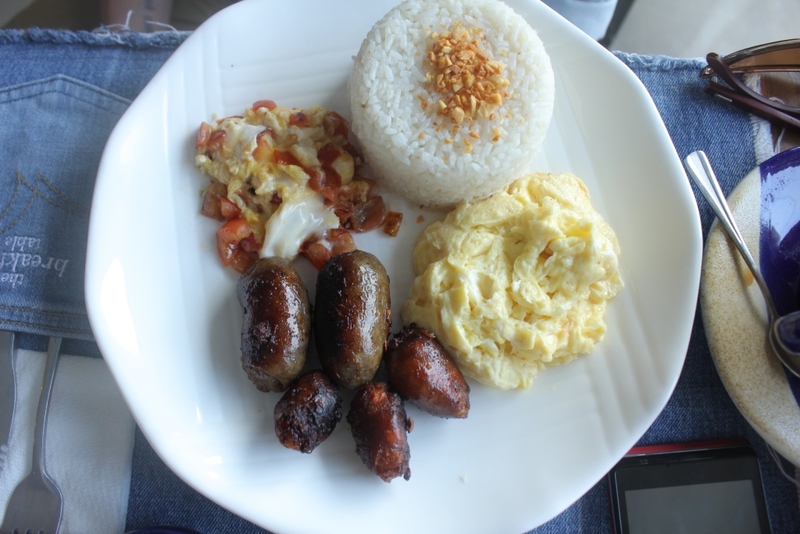 They have that adobo rice omelette meal twist. On weekends they have buffet and other set meals. You’ll love their interior. They have the cutest faucet. and the service makes it a happy breakfast place. I could go on but maybe I am biased because it’s walking distance from our place. haha! You’ll love it. I promise. I think another post is in order. Perhaps more on recommendations. Here’s to a brand new day! I don’t think it’s weird that it was my first time to try ordering food at Icebergs after all it’s not like me to order items that are clearly not their specialty. 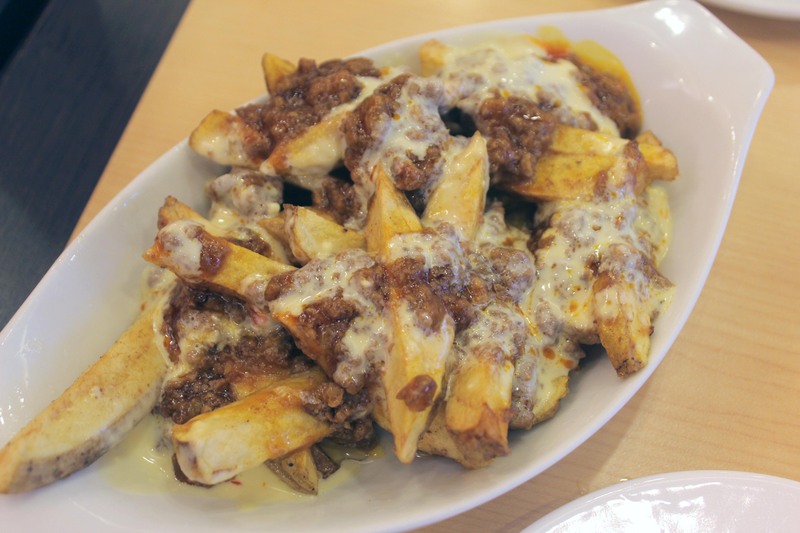 Steph and I ordered a greasy serving of chili fries and buffalo wings. I did like the homemade potato chips and the dip with hints of blue cheese served on the side but I kinda missed celery sticks. 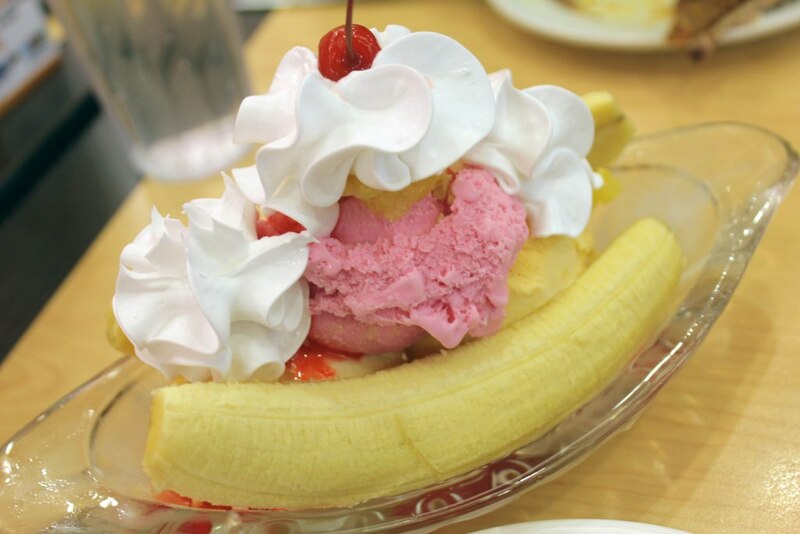 The banana split was the only thing that didn’t leave me feeling guilty. I thought the whipped cream was over the top but the scoop of mango ice cream was too good for me to complain. Is that Magnolia ice cream? Well it’s awesome whether or not you decide to share it with someone. Here’s to mango ice cream! Service was really bad by the way so be patient. One time 5 titas and a nephew went to Sebastian’s, an artisan ice cream joint. Each of them ordered a different flavor so that they can try six in one go (of course they were able to sample more mini spoons care of the shop). One of them flavors was red velvet cheesecake. As you may know it, coffee is what dessert means to me that I am mostly clueless when people ask me about dessert. Oh but how lovely all the flavors, textures and other sensations that helping was! I never expected to enjoy ice cream that much so I thought the cake must be good too. I’ve decided to sample as many red velvet cheesecakes as I can. Poco Deli deserved to be the first slice because I liked it very much. Actually, I shared it with about 5 people so I should restate… We loved it very much. Borough’s was also a contender. 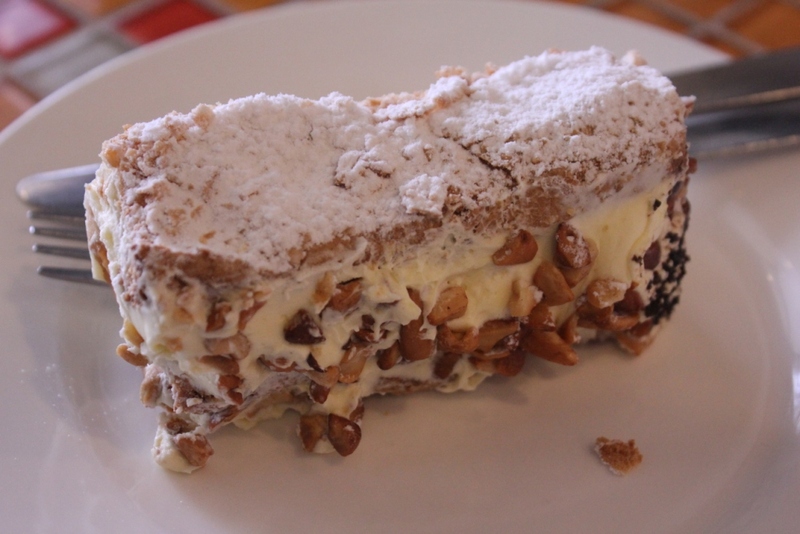 It was quite a hefty slice and the walnut made it fancier but I think it’s a bit too pricey. 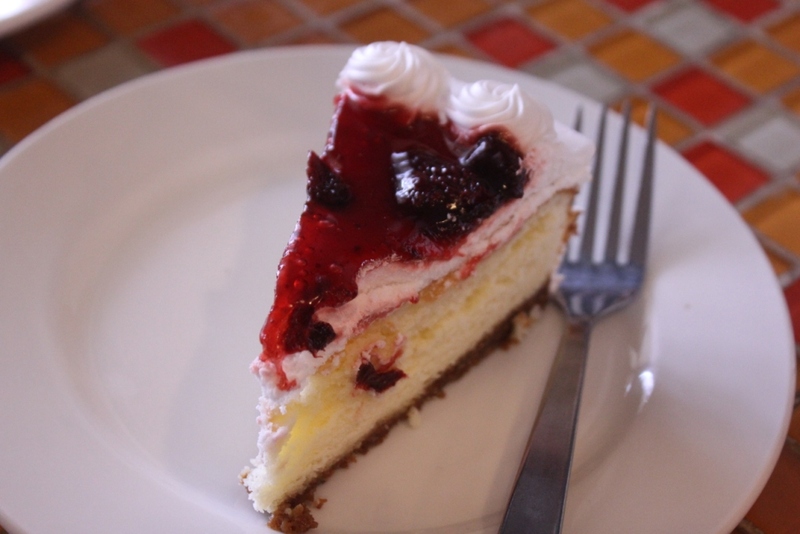 Cab Café’s was very cheap at 50 pesos but unfortunately the cake was too dry and the icing was too stiff. It also lacked that cheesy frosting I crave for. 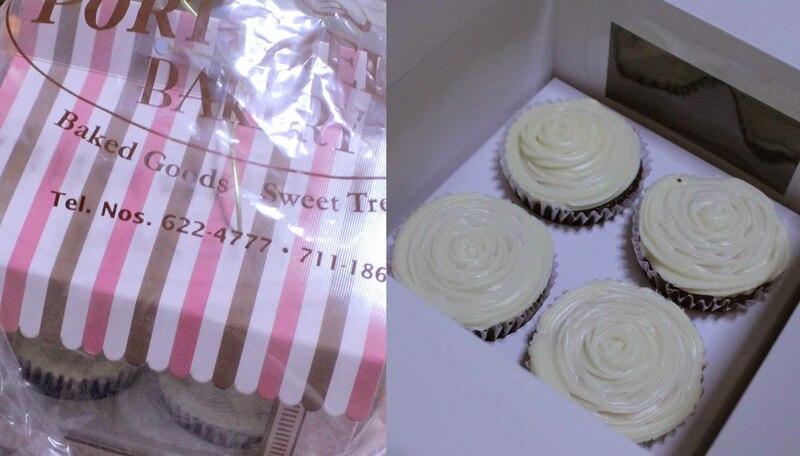 Café Dolce Amore’s cupcake had superb semi-sweet, cheesy and tangy frosting but the velvet was not “velvety”at all. Portobello’s cupcake may not be as bold red as other red velvets but all in all it’d probably win the best among those listed here. It’s not too sweet, the rich frosting was not too cloying and everything just blended together (it’s also priced right!). Slice’s cake I think was not exactly a cheesecake but the cake sure was perfectly moist and the frosting was flawless. However, it’s the cheesy taste that I want to counter the sweetness. I need it. Plus, cakes from Slice are so expensive. They’re about as expensive as a hearty meal (or more). Their cupcake (Slice’s) which I believe is a cheese cupcake was more affordable than their cake at 85. My boyfriend and I shared one in about 4 bites. Sugar Mommy House’s came in squares. We got two for the price of one which is 120. Not bad for its size. While it’s sweeter than the average, I’ve no qualms as the frosting was cheesy rich. It melted on my way home and it looked even more so appetizing. Haha. Cukay’s cupcake was also cheap but the frosting was misleading. It was all sugar and not cheesy at all so both Phil, my boyfriend, and I scowled at the sweetness that shocked us. 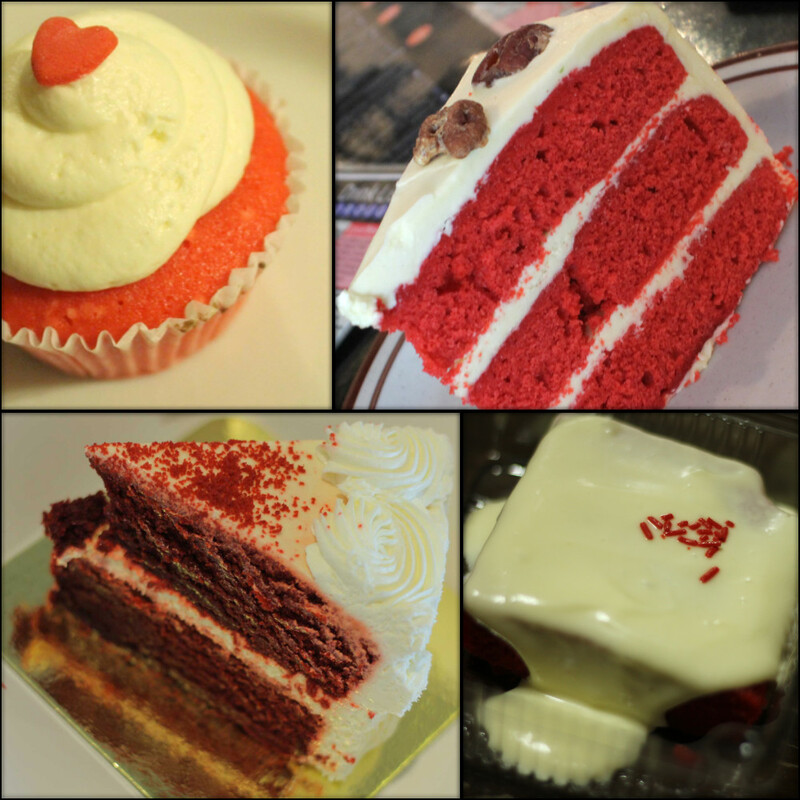 Goodies n Sweet’s cupcake had very faint cheesy tones for their frosting and mostly I tasted sugar. At least the cake itself was good. I hope all cakes came in cupcake helpings because believe it or not, I find it hard to finish even a cupcake on my own. 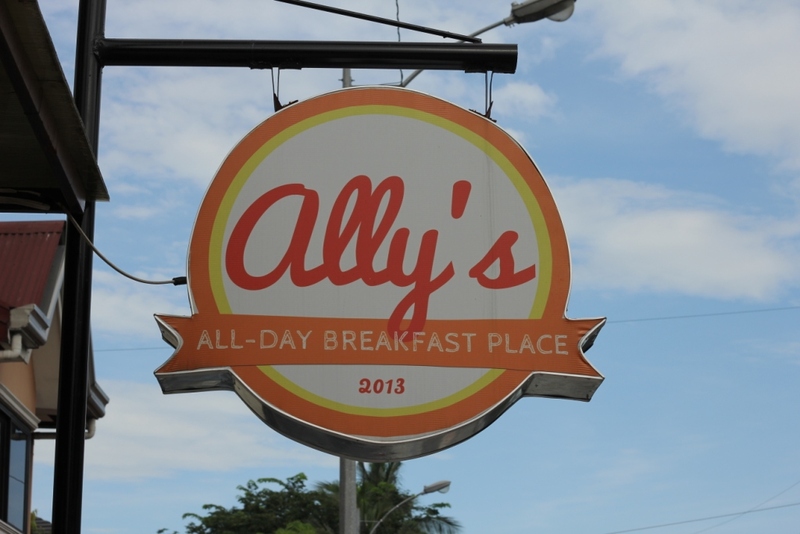 Ally’s All Day Breakfast Place – Malingap St. I wanted breakfast so to Ally’s we went! There are no misses for all day breakfast places. Even at the time I slept through mornings, breakfast food was never forgotten. 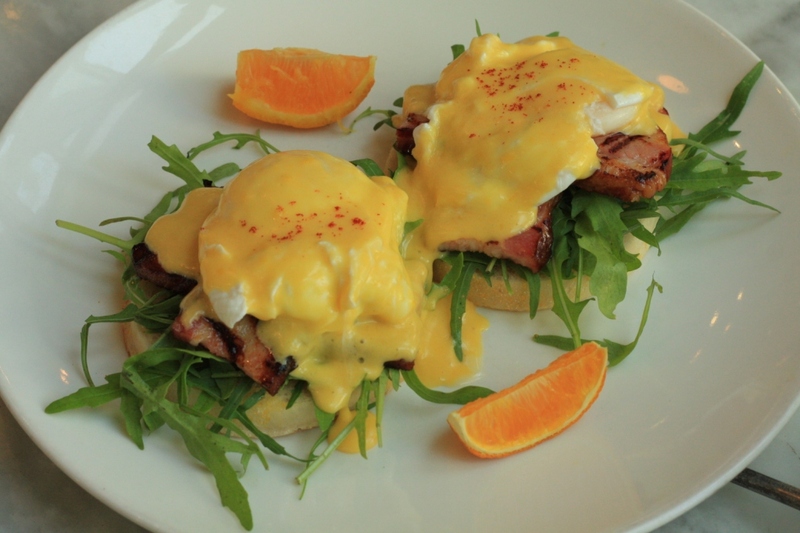 It’s the most important meal of the day and you should make it so. The bacon dynamite got us curious. It looks so sunny in the picture but really it’s more of a sinful kickstarter. Phil ordered adobo flakes while I opted for tapa. Each had a generous serving of rice, 2 eggs, about a teaspoon of salsa (haha!) 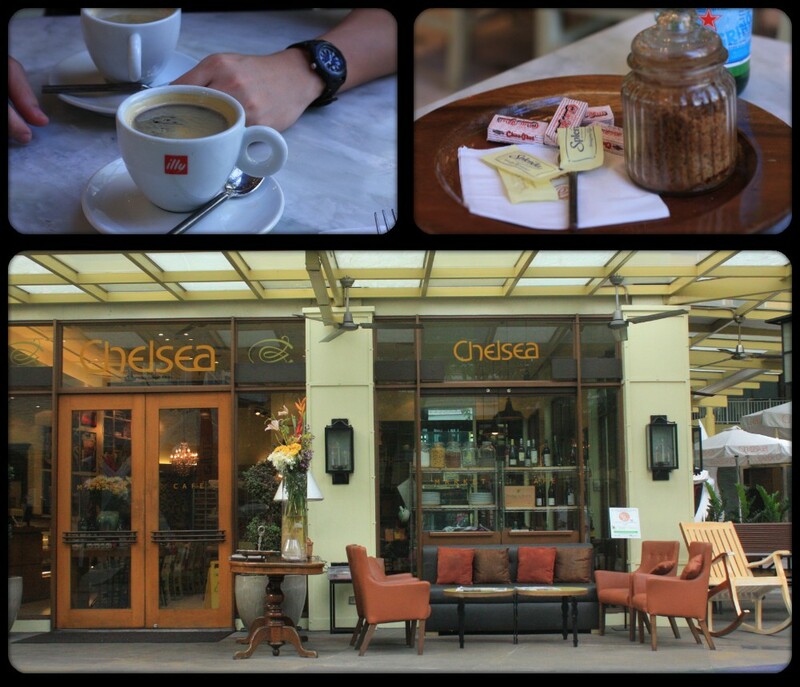 and a glass of iced tea (add 15 pesos and you get a cup of brewed coffee). They’re very tasty and I bet perfect for most people (for us it was a bit on the salty side but we have very bland taste). It might not be a very satisfying breakfast for people with huge appetites but I think it’s fine if you want to try out their pancakes. It’s a bit embarrassing that we didn’t get to order any of those but I promise we soon will! 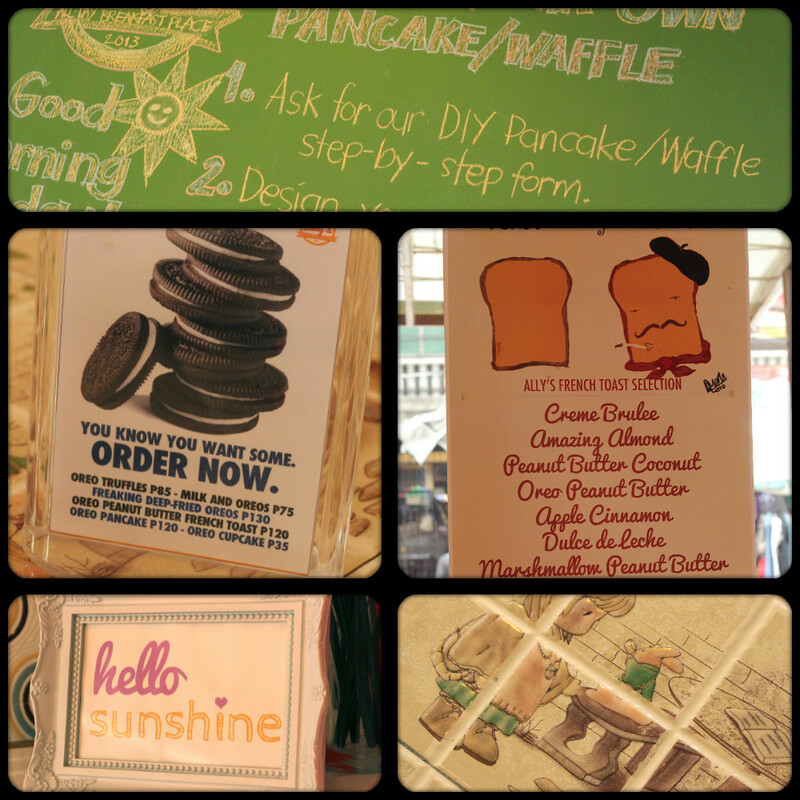 They have treats like stuff with Oreos, french toast, pancakes and waffles. I also saw some cupcakes but I don’t think cakes is a specialty. But don’t fret, the wide selection will make you forget about cakes and wonder if you can have two or three desserts instead of one. 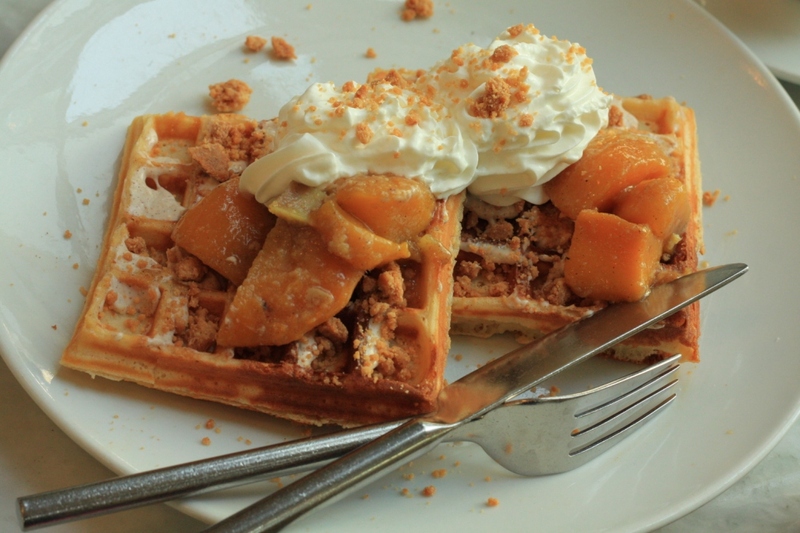 If you still can’t decide, then opt for DIY pancakes or waffles. I’m sure you’d find that enjoyable. The tiles they used for their tables, by the way, are the sweetest in the world! 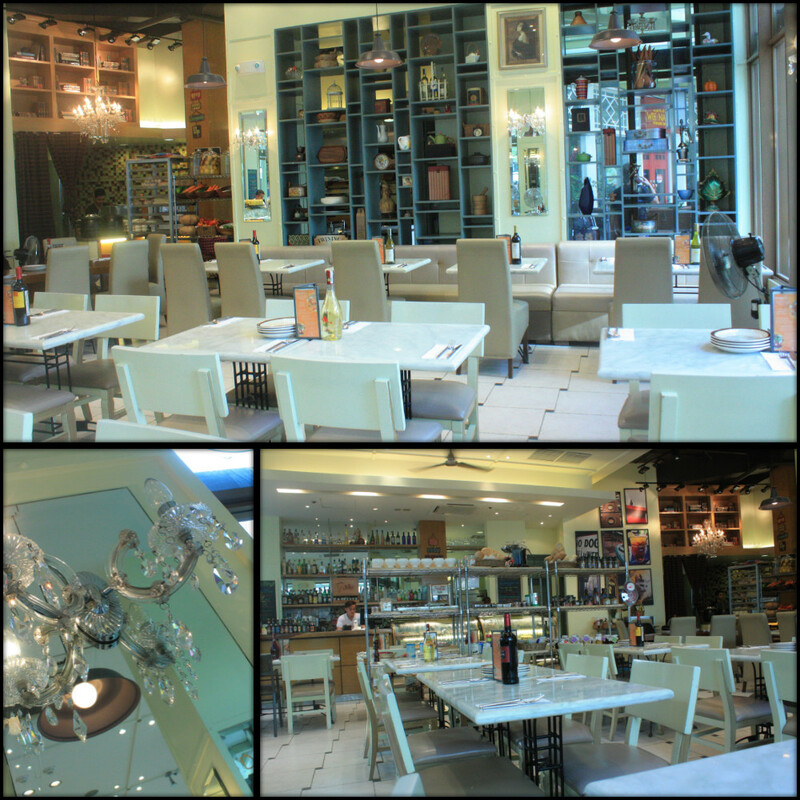 Max Brenner is something I found intimidating due to its location at Greenbelt. Remember it used to be so near the Hermes boutique which suggested that their chocolates were as expensive? (sobra naman!) ahaha! And it was indeed a bit steep when we tried it at Mall of Asia. But I think it’s worth the splurge most especially for chocolate lovers. 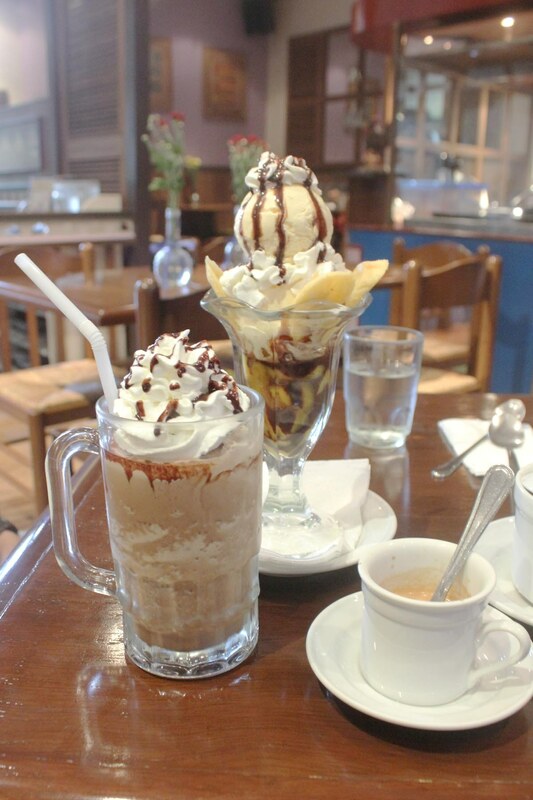 The thing about dessert is that it is not like a meal, it can always be shared so if you find it too expensive then split it with a friend or two. Sampling will be quite slow I suppose but meet your friends often and soon you’ll finish the whole menu! Hahaha. Sorry that I cannot remember our orders. One choco granite I think and something else. I am betting that you will be happy with whatever you’d pick out. They’re just not the ordinary dessert place. 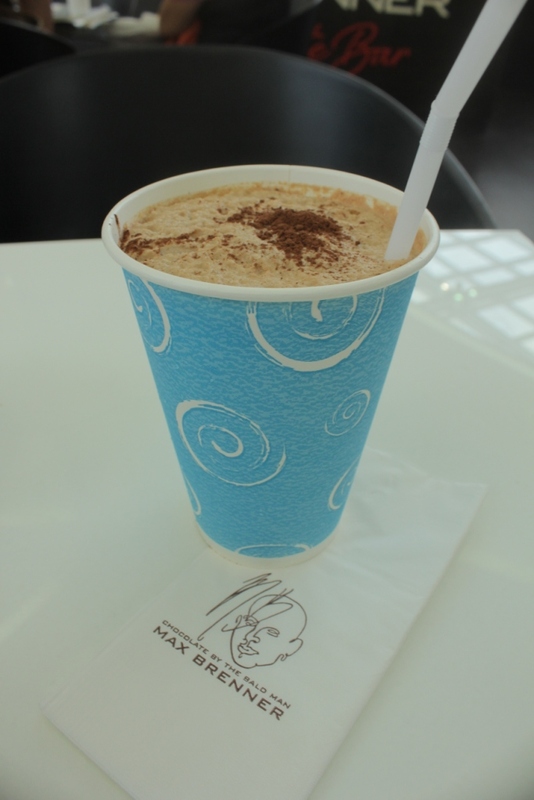 Unlike Max Brenner, Café Breton is a place I call home. I remember this server (Podium branch) who recognized me no matter how much I weigh (thin, gained a bit, gained a lot), no matter what I wore (jeans, skirt, etc) and no matter what my hairstyle was (long, short, bald, under a hat). The surprising thing there is that I wasn’t even a regular customer. He’s that good! I love Breton because of their savory crepes. My favorite has always been Dracula. It’s got cheese, onions and tomatoes and I use a bit of Tabasco for a bit of heat. I like their coffee beverage list (especially at the time when “modern” coffee shops were still not around). And of course I love it that you can make your own crepe. Hahaha! Signing my name over a dish is a weakness! 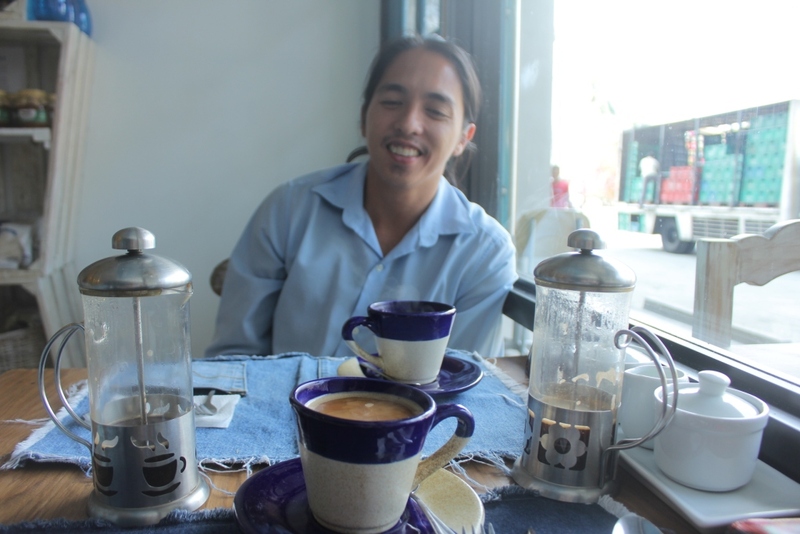 It’s weird though that I rarely blog it (well, because it’s not exactly something new). We got to try a slice of frozen blueberry cheesecake, sansrival and the raspberry cheesecake (I’m not sure if I got all them correctly though). The raspberry cheesecake tasted just fine. I wouldn’t rave about the frosting or the toppings but the sponge itself surely was moist, rich and lovely. The sansrival on the other hand is the nutty and chewy kind which I happen to like. But I equally like the buttery type that does not require a knife. The one that melts even before you put it in your mouth. Actually I like sansrival even if I don’t have a sweet tooth so most helpings will garner nothing but praises. haha! The same goes for sylvannas and the like (how do you spell that?). The frozen blueberry cheesecake was the one that did not deliver. It was gelatinous which is something that I don’t like in cakes. 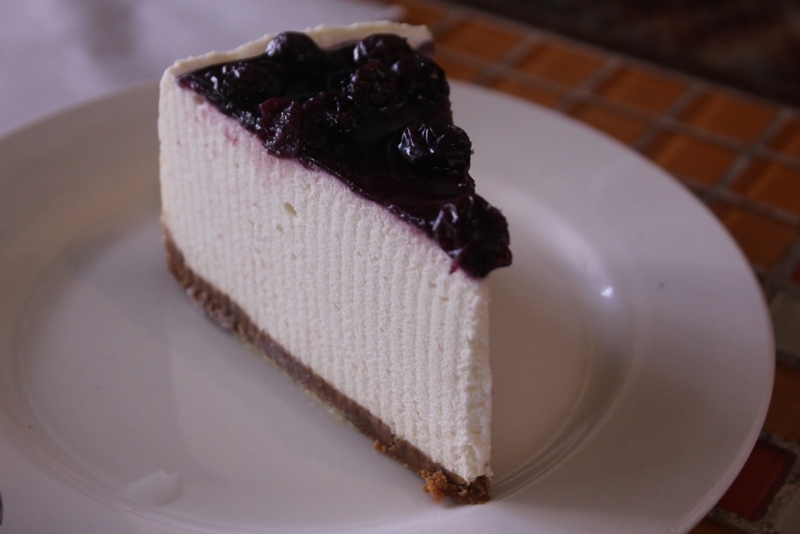 But anyway the other blueberry cheesecake slice at Sancho’s is also good so just pick that one. The good thing about this joint in Maginhawa is that they also have meals which are equally good. Not spectacular as fireworks but they’re still something that would make you feel good about your day or your weekend. Cheers!